Tech You Can Do: #PodPeeks: Check This Out! 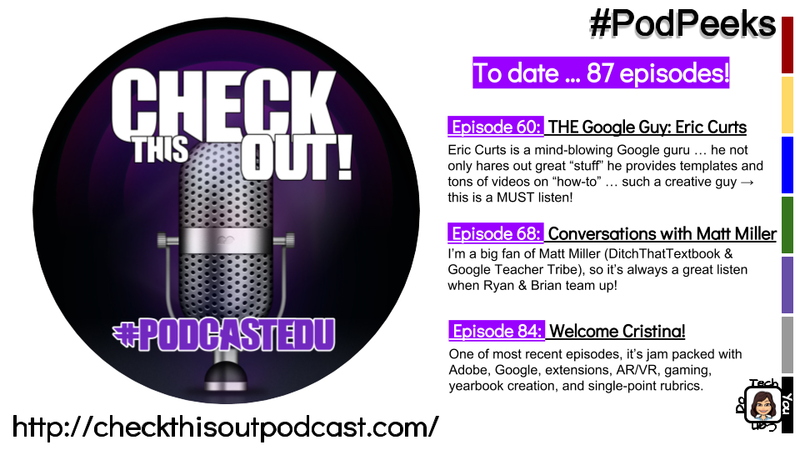 Today's featured #TechYouCanDo podcast is "Check This Out!" with Ryan O'Donnell and Brian Briggs. Their podcast does a great job of sharing out a TON of edtech in each episode. Make sure you either bookmark their show notes or have a notepad and writing utensil handy when you listen so you can jot notes and check it out! They cover a LOT and a wide variety, so you are sure to find at least one little nugget in each episode. The episodes are a bit longer ... but very much worth the listen! I haven't been a long-time listener - they've got 80+ episodes recorded, so you will have a no problem filling your summer days with Ryan & Brian.